Rescuers arrive at the site where a military transport plane crashed in southern Morocco, with reports of 78 people dead. 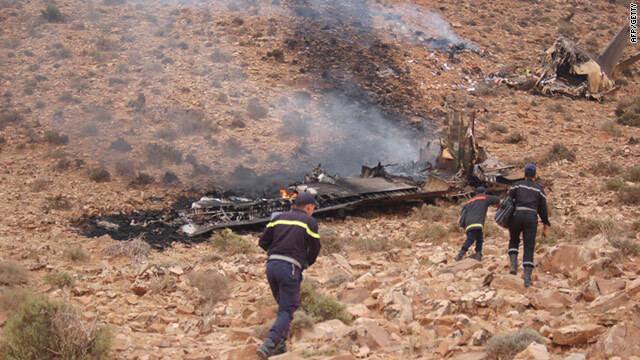 (CNN) -- A plane crash in southern Morocco killed 78 people Tuesday, the state news agency reported. The plane was flying from Agadir to Al-dakhla and was carrying 81 people -- 60 military, 12 civilians and nine crew members, Agence Maghreb Arabe Presse reported, citing a military statement. The plane crashed at 9 a.m. (4 a.m. ET), 10 kilometers away from the city of Guelmim, the statement said. Local news agency Lakome.com, citing sources with knowledge of the event, said rescue efforts were ongoing. Ali Anozla, managing editor of Lakome, said local sources told him the cause of the crash was bad weather.